Today’s GDP report estimated that the US economy grew at an annual rate of 2.5 percent in the first quarter of 2013. If the economy were translating GDP growth into jobs at rates similar to those seen in the past, this 2.5 percent pace would not get us to full employment until, say, the end of Hillary Clinton or Jeb Bush’s second term. But evidence suggests that, in fact, the link between output and jobs has been weakening for the past thirty years or so. In other words, we need higher growth rates today than we did thirty years ago to produce the same employment increases. In that context, 2.5 percent growth is nowhere near good enough. But in addition to these slow growth rates, Nikiforos details the increasingly weak link between output growth and job creation: “[D]uring the recovery in the second half of the 1970s, a 1 percent increase in output led to an increase in employment of 0.714 percent. This number has been decreasing since the late 1970s and stands at 0.288 in the current recovery (i.e. 2009Q2–2012Q4).” In the policy note he runs through some possible reasons for this degraded link between output and jobs (including some research from a forthcoming paper by Deepankar Basu and Duncan Foley that points the finger at the growing share of the financial sector in GDP, which, they argue, leads to an overestimation of real economic activity). To give a sense of the challenge we’re facing, Nikiforos observes that just bringing the unemployment rate down to 5.5 percent by the end of 2014 would require the economy to grow at an annualized rate of 3.4 percent this year and 6.3 percent next year. Read the policy note here. The 22nd Hyman P. Minsky conference, “Building a Financial Structure for a More Stable and Equitable Economy,” is underway. Today featured speeches by James Bullard of the St. Louis Fed, Eric Rosengren of the Boston Fed, and Thomas Hoenig of the FDIC. This year’s event combines the Minsky conference’s usual focus on financial stability and financial reform with another of Minsky’s abiding intellectual interests: full employment policy. This was reflected in today’s varied panel sessions on measuring inequality, Minskyan employment policies, and the current state of financial regulation. Follow the second and third days of the conference, livestreamed here. Tomorrow will feature Narayana Kocherlakota, Sarah Bloom Raskin, Alan Blinder, James Galbraith, Jan Kregel, and L. Randall Wray, among many others. Audio of all sessions and speakers is posted here; media coverage can be found here in the press room. What Is the Political Payoff of Proposing Social Security Cuts? The President’s budget has arrived and, as reported, it does contain proposed cuts to Social Security (through adopting a different measure of inflation called “chained CPI”). The emerging consensus seems to be that this is mainly intended as a political/messaging ploy. The idea here is that Republicans are extremely unlikely to make a deal that contains any revenue increases on high-income-earners; even one that includes the entitlement cuts they have (sort of) demanded. As a result of the President putting these cuts on the table in so public a fashion, so the theory goes, centrist op-ed writers will finally drop the false equivalence and declare that Republicans are being intransigent and are not negotiating in good faith toward a grand deficit-reduction bargain. Paul Krugman points out that this is an exceedingly unlikely scenario. But even if DC pundits play along, here’s a question about this gambit that I don’t think has an obvious answer: what’s supposed to happen next? What’s meant to be the tangible payoff of the new narrative that would be created by all these editorial spankings? Put it this way. What will have a bigger impact on a (generally more elderly) midterm electorate in 2014: ads about Republican obstinacy featuring sorrowful quotations from Fred Hiatt, or ads savaging Democrats for trying to slash Social Security? Charges of hypocrisy are unlikely to carry much weight with an electorate that suffers no cognitive discomfort in demanding that “spending” be cut but “Social Security” preserved or strengthened, and they’re even less likely to work if a voter is unaware that Republicans have even mentioned chained CPI as part of their wish list. In fact, it’s hard to see how the overall message wouldn’t just boil down to this: Republicans are being stubborn … in refusing to go along with very unpopular cuts. How many more House and Senate seats will that deliver to the President’s party? While we are seeing some economic growth, the unemployment rate is not responding as strongly to the gains as it did in the past. This slow job growth — today’s “jobless recovery” — isn’t an outlier. It’s a phenomenon that has been increasing over the last three decades, with jobs coming back more and more slowly after a downturn, even when GDP is increasing. The weak employment response has been an almost straight-line trend for more than 30 years. Our institute’s newest econometric models show that each 1% boost in the GDP today will create, roughly, only a third as much improvement to the unemployment rate as the same 1% rise did in the late 1970s. For more on this broken link between output and jobs, the background research can be found here. 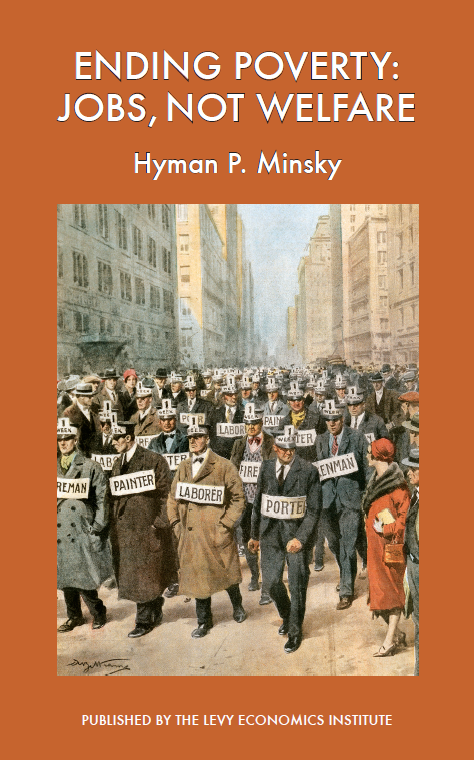 Hyman Minsky is probably best known for his work on financial instability and financial reform, but he also wrote extensively about how to address the persistent problem of all those left behind by our increasingly financialized economy; about how to design policies that would put an end to income poverty in the midst of plenty. Despite the fact that far more attention has been paid to his writing on financial fragility, these were intimately related issues in Minsky’s research, connecting the financial and “real” economies. As with his work on finance, Minsky’s approach to poverty did not fit comfortably within the confines of the status quo. With “trickle-down” on one side, pure tax-and-transfer approaches on the other, and vague calls for retraining floating somewhere in the middle, Minsky found the conventional menu of policy options incomplete and inadequate (a menu that has changed very little over the last several decades). Calling for “upgrading” workers without ensuring there are enough jobs to go around is, as Minsky put it, “analogous to the great error-producing sin of infielders — throwing the ball before you have it.” What’s missing, he thought, is a commitment to ensuring that paying jobs are available to all who are ready and able to work; a commitment to “tight full employment.” The question is how to get there without sparking runaway inflation or inducing financial crises. Private markets, left to their own devices, aren’t going to get us there. For part of the answer, Minsky turned to a forgotten side of the New Deal: direct job creation. In the interests of providing a more complete picture of Minsky’s intellectual legacy, the Levy Institute has published a collection of his central writings on poverty and full employment: Ending Poverty: Jobs, Not Welfare. The chapters span roughly three decades of Minsky’s writing and feature four never-before-published pieces. The earliest were written in the context of the “War on Poverty” of the Kennedy and Johnson years, but readers will find more than mere historical interest here. Minsky’s critiques of both the “neoclassical synthesis” and the welfare state hold up rather well. If anything, the material is even more relevant today, given our widening income inequality and chronic rates of long-term unemployment — and the fact that the battle against poverty, while not won, has largely been forgotten. The paperback is now available on Amazon; the Kindle version will be appearing shortly. Here are today’s big pieces of economic policy news: (1) net job creation in the month of March (+88,000) was too low to keep up with population growth; (2) the president’s budget proposal will reportedly include cuts to Medicare and Social Security (or as the latter will be described in most newspapers, “adjustments to the way inflation is calculated for the purposes of determining Social Security benefits”). There have been many concerns expressed on the internet about the eventual necessity of reversing the Fed’s cheap-money policies, which include “quantitative easing,” as well as a near-zero federal funds rate. One idea some have is that there are “too many bonds” in the Fed’s portfolio, and that problems will occur with insufficient demand whenever the Fed attempts to reduce its holdings. This doomsday scenario often seems to vex public discussion but is unlikely to materialize, given that the Fed can always make use of its ability to “make a market” for Treasury securities. An alternative way of looking at the same situation is that there is a huge amount of money and money-equivalents on bank balance sheets and in nonfinancial corporate coffers, and that the tendency of the modern economy toward financial fragility will eventually lead to risky loans and investments using these funds. (Jeremy Siegel adopts this view in the FT, with, however, an unfortunate emphasis on the possibility of a takeoff of inflation. Inflation remains below the Fed’s 2-percent approximate objective, and the greater risk by far is still recession. An Alphaville comment on his column makes the point that the threat of fragility remains regardless of whether banks have excess reserves on hand.) Concerns have already emerged about “junk” bonds, so-called leveraged loans, and other effervescent areas of finance. Of course, the problem then becomes for the authorities to implement an appropriate restraint on financial excesses. One conventional method would be to increase interest rates using open-market operations, which would of course probably entail the sale of securities. This scenario unfortunately might lead to some serious threats to financial stability, including problems that short-term and/or variable-rate borrowers might have meeting payment commitments on their debts, if the Fed were to raise interest rates sharply. One big historical example of this kind of fragility is the rise in short-term interest rates that occurred in the late 1970s and early 1980s at the behest of the Fed. The resulting delta-R effect helped to bankrupt Mexico, among other disastrous impacts. Many years before that, the Fed was more inclined to use direct controls on credit, restricting the amount of money banks could lend out. Key to the situation today, efforts are ongoing in Washington to formulate and implement appropriate rules to insure that various kinds of bank lending do not get out of hand in the first place. Efforts of this type would be unlikely to completely prevent future crises, but, if effective, would act to reduce fragility. Among other benefits, this approach might also permit the recovery in housing investment—currently only in a fledgling phase—to continue. Given the problems that sharp interest-rate increases can bring, it would also be helpful to keep the effects of moderate inflation in perspective, and to cope with inflation in non-destabilizing ways. From Mariana Mazzucato’s “Rethinking the State” series.